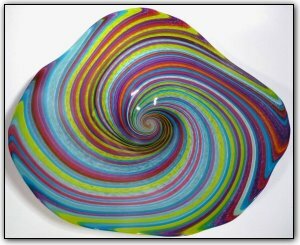 This vivid and colorful wallbowl features many colors of the rainbow made from brightly colored hand pulled canes. Making a cane wallbowl is a time consuming two-stage process. First Dirwood hand pulled the canes used to make this bowl, then he made the bowl using those canes. This wallbowl is also quite large, measuring nearly 2 feet in diameter!